Many parents want their child’s Halloween costume to be as safe as possible. Unfortunately, not all parents know what can be done to make their child’s costume more safe. Below are a series of suggestions that can help parents assemble a safer Halloween costume for their child. 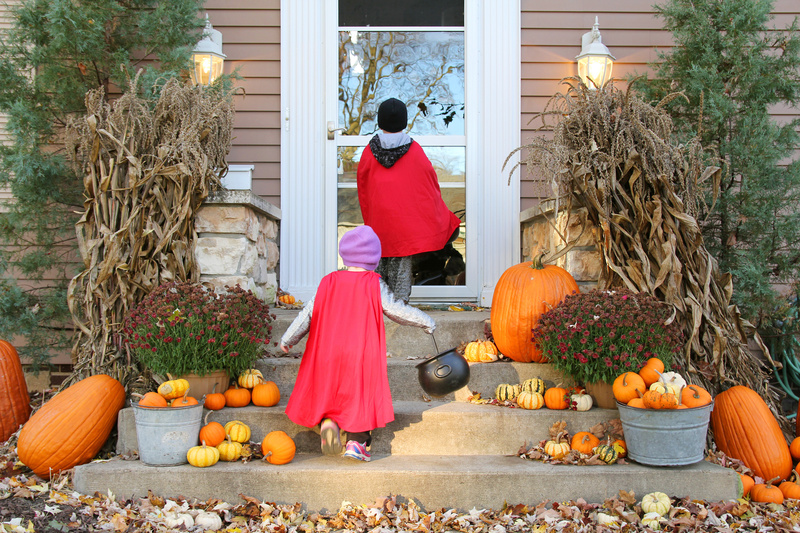 Two young children dressed up in costumes are waiting at a house for candy while Trick-or-Treating on Halloween. 1. Choose easy to see clothing. Bright colors and reflective materials should be incorporated into your child’s Halloween costume. This will make your child easier to see as the daylight begins to fade, helping both motorists and other trick-or-treaters spot your child. Bringing along a flashlight can also help increase your child’s visibility to others. 2. Purchase a flame resistant costume. Because candlelit jack-o-lanterns are a popular Halloween tradition, it is important that your child’s costume and accessories be flame resistant. While costume shopping, look for labels that state “flame resistant” and avoid costumes that cannot be easily removed should an emergency situation occur. Keep in mind that flame resistant does not mean fireproof. Remind your child to exercise caution whenever a lit candle is nearby. 3. Dress for the weather. Depending on the local forecast for your area, your Halloween weather may be hot or cold, with a chance or rain or snow. Be sure to check the weather forecast in advance and dress your child accordingly. In cooler climates, loose costumes should be prepared that allow for layering clothing underneath. In warmer climates, breathable materials are preferred so that your child does not become overheated. 4. Consider using face makeup instead of a mask. Because masks can interfere with your child’s vision and breathing, you should consider using face makeup instead. Be sure to test any makeup that you will be using on a small patch of your child’s skin prior to Halloween night, as some cosmetic ingredients may irritate your child’s skin. If you do decide to use a mask, be sure that it fits properly without limiting your child’s vision or affecting your child’s ability to breathe normally. 5. Wear sturdy walking shoes. Trick-or-treaters often walk great distances on Halloween night. During this time, it is best for your child to wear a sturdy pair of walking shoes. Not only will walking shoes be more comfortable on your child’s feet, but they can also help to prevent injuries caused by tripping or falling. Decorative shoes that feel uncomfortable or unfamiliar to your child can spell disaster as the night progresses – especially if the shoes make it difficult for your child to walk normally. When parents are able to make their child’s costume safer, Halloween becomes a more enjoyable experience for everyone involved. It is as simple as choosing easy to see clothing, purchasing a flame resistant costume, dressing for the weather, considering face makeup instead of a mask, and wearing a pair of sturdy walking shoes. A safer Halloween is a happier Halloween.